At A to Z Eye Care our goal is a lifetime of eye health for all of our patients, and there’s a lot more to your eyes than just your vision, so it’s important to visit us for an annual eye exam, even if you aren’t experiencing vision problems. One of the more common problems that affect patients is dry eye syndrome. When we blink, a thin tear film covers the surface of our eyes, offering our eyes protection. In order to maintain optimal eye health and comfort, the tear film needs to remain intact between blinks, but some patients don’t have enough tears or their tears are too short lived, leaving them with dry, irritated eyes. Age: A part of the natural aging process, tear production diminishes, as you get older. Gender: Due to hormonal changes caused by pregnancy, oral contraceptives and menopause, a lack of tears is more common among women. Medication: Certain medications can affect the amount of tear fluid produced. Medical Conditions: Certain medical conditions reduce tear production such as diabetes, rheumatoid arthritis, and thyroid disorders. Environmental Conditions: Dry climates, windy conditions, and exposure to irritants such as smoke or dust can all contribute to dry eyes. Other Factors: Extended periods of time in front of a computer screen, LASIK or cataract surgery, and the use of contact lenses can all be a factor in the development of dry eyes. The first step in managing dry eye symptoms is to visit our optometry office so one of our eye care professionals can determine the severity of the problem. 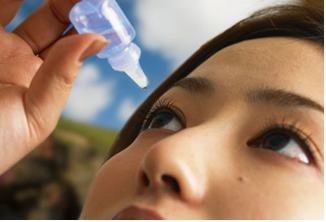 For chronic dry eyes, our optometrist will determine the best approach to manage and treat the issue, with solutions ranging from adding tears to treating eyelid inflammation. If you are experiencing discomfort consistent with dry eye syndrome, there are some self care tips you can use to reduce symptoms. If you spend the majority of your day staring at a computer, remember to blink regularly. If you find your house or workplace to be dry, try using a humidifier to increase the level of humidity. Always wear sunglasses outdoors to protect your eyes from the sun and wind. Last, Nutritional supplements containing essential fatty acids can alter the composition of your tears, leading to a longer lasting tear film. If you are experiencing discomfort related to dry eyes or have any other questions about eye health, contact our optometry office. We are conveniently located in Arcata, CA and serve the surrounding communities of Eureka, Humboldt and more.